wall building – is this ordinary life? On Saturday I ‘only’ did 2 or 3 hours work, on Sunday ‘only’ about 8 hours and yesterday, Monday, ‘only’ 8 hours … and spent the rest of the time wall building in the garden :-)Â With that and two evenings last week when I had left the office ‘early’ at 7pm, I have about 20 foot of wall over 18 inches high.Â The wall is built of small stones scavenged from the soil as I dug and moved it about over the last few years (there is a lot of stones in our garden! ), so actually a lot of work behind 30 square feet of wall. I have got so used to 24/7 working that I have entirely forgotten what it is like to simply take a little time not at the computer, reading papers to review, or in meetings.Â After 3 days of what would end up being ‘only’ a 50 hour week it feels like I’ve been on holiday for ever! What has happened to academia that the opposite has become ‘normal’? Iâ€™ve just been at a two-day workshop on “Tags and Tagging” organised by the “Branded Meeting Places” project. 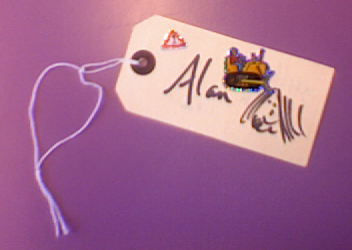 Tags are of course becoming ubiquitous in the digital world: Flickr photos, del.icio.us bookmarks; at the digital/physical boundary: RFID and barcodes; and in the physical world: supermarket price stickers, luggage labels and images of Paddington Bear or wartime evacuees each with a brown paper label round their necks. Indeed we started off the day being given just such brown paper tags to design labels for ourselves. As well as being labels so we know each other, they were also used as digital identifiers using a mobile-phone-based image-recognition system, which has been used in a number of projects by the project team at Edinburgh (see some student projects here). We could photograph each others tags with our own phones, MMS the picture to a special phone number, then a few moments later an SMS message would arrive with the other person’s profile. Being focused on a single topic and even single word ‘tag’ soon everything begins to be seen through the lens of “tagging”, so that when we left the building and saw a traffic warden at work outside the building, instantly the thought came “tagging the car”! The workshop covered loads of ground and included the design and then construction of a real application â€“ part of the project’s methodology of research through design. However, two things that I want to write about. The first is the way the workshop made me think about the ontology or maybe semiology of tags and tagging, and the second is a particular tag (or maybe label, notice?) … on a toilet door … yes the good old British scatological obsession. I recall the context now. 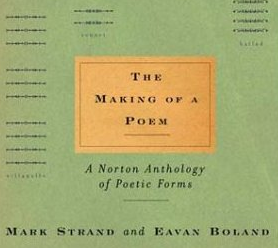 I has been reading “The Making of a Poem” a lovely book, that discusses different poetic forms both history and current use and with loads of examples of each, classic and modern. I was talking to Masitah about the pantoum, a Malay poetic form where the 2nd and 4th line of each verse become the 1st and 3rd line of the next verse. I constructed the above as an example as we chatted! I had typed it into an email to save it and there it has lain, forgotten, ever since. I think traditional pantoums have a particular rhythm structure within each verse, so my attempt above has the right line structure structure, but not the right metre. However, I did like the way it created an apparent continuity, yet the meaning could shift underneath – in this case from spring to winter. My favourite in the book was a modern pantoum by J. M. McClatchy. He repeats the sound of the lines … but not necessarily the words … so in the first verse, the second line is “Seem to pee more often, eat” and in the beginning of the second verse this becomes “Sympathy, more often than not“. Or in the middle “The hearth’s easy, embered expense” becomes “The heart’s lazy: remembrance spent“. Now back to looking for those urgent mails before the train! Just read Adam Greenfield’s blog entry “Reality bites“. He describes how a design he produced for a friend’s new restaurant became a solid metal sign within days. Despite knowing about recent rapid fabrication techniques, actually seeing these processes in action for his own design was still shocking. I too am still amazed at the relative ease that ideas can be turned into reality. In a presentation “As we may print” at the 2003 Interaction Design for Children, Michael Eisenberg described how he and his co-workers at University Colorado were using laser cutters to enable children to design their own 3D designs in card or even thin plywood. More recently at the National Centre for Product Design and Development Research in Cardiff, I saw 3D metal printers. I was aware of 3D printers working in various gels and foams, but did not realise it was possible to create parts in titanium and steel, simply printed from 3D CAD designs. Chasing one of Adam’s links I found instructions to make your own 3D printer on the MIT site … however, this constructs your designs in pasta paste not metal! One of the arguments we are making about our FireFly technology is that it will change lighting from being a matter of engineering and electronics, to a digital medium where the focus moves form hardware to software. While FireFly allows more flexible 2D and 3D arrangements than other technologies we are aware of, it is certainly not alone in making this transformation in lighting. Last week I was talking to Art Lights London and they are planning some large installations using Barco’s LED lighting arrays. Soon anything that you can point on your computer screen you will also be able to paint in light from your own Christmas tree to London Bridge. Although it sometimes seems that technology is simply fuelling war and environmental catastrophe, it is a joy to still glimpse these occasional moments of magic.